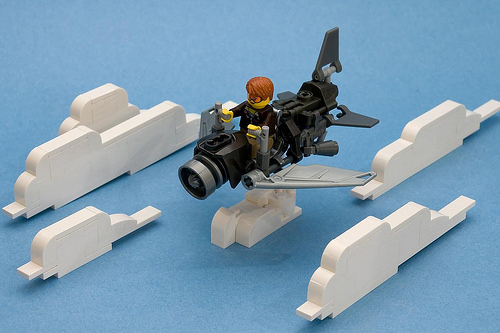 Take to the skies in style with Ted Andes‘ latest LEGO creation. This single-seater aircraft has a dieselpunk feel, with an impressive level of detail for such a small creation — much of it down to the intelligent repurposing of Bionicle armor pieces. The brick-built clouds around the plane give the whole image a wonderful cartoonish sky effect, but the highlight of the model for me is that slight downward angle on the nose turbine — a lovely touch. This post comes two months after Erik (Lemon_boy) first posted his Boyetz and eight days after he posted a trio of them. The lateness is, however, not my fault as flickr keeps dropping people from my contact list, including Erik. 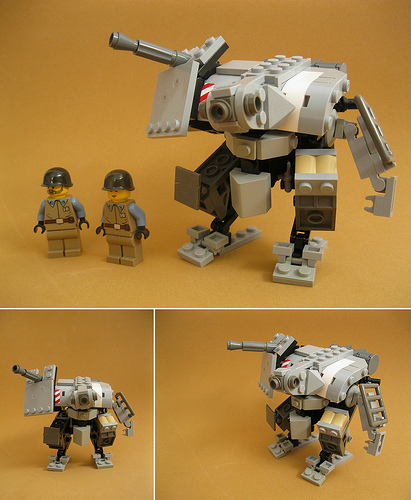 This robotic beast has fantastic character, and shows that you can leave studs exposed and still come up with a plausible design.